Death of Monopoly: Wits & Wagers Party! I am excited to review the new version of Wits & Wagers Party. As someone already a big fan of the original version of the game, Wits & Wagers, I was honoured that North Star Games was willing to send me a copy of the game before it is released this weekend at GenCon. I am said to miss out on GenCon in Indianapolis from August 16-19. One day I hope to attend. Meanwhile, let me preview the new version of Wits & Wagers Party for you all. As the tagline says above, the game comes with some great question cards, better components, and simpler rules. As a fan of the game already, I must admit, I am very excited to get more question cards. I have played my copy enough that I am beginning to remember (at least ballpark close) the answers to some of the questions from my original copy. The new question cards are actually from the out-of-print Wits & Wagers Expansion pack #1. I was always sad to miss out on getting the expansion pack, so Im excited to finally get my hands on these question cards. The question cards included in this edition are lighter and more fun. This makes the game even easier to play with gamers or non-gamers. I will be sure to mix and match my question cards between the two versions I know own. How Many Licks does it really take to get to the centre of a Tootsie Pop? The components are better then my older version of Wits & Wagers. The poker chips are a better quality. I would have preferred clay poker chips to be included, but I understand the choice to keep the game affordable. Rumour has it that the game will be on the shelves in the near future at Wal-mart & Target. A huge accomplishment for one of the smaller publishers. Hopefully it will make it on the shelves in the Canadian Wal-mart stores & Canadian Target stores (opening soon). The markers have a nice eraser end attached to the lids. And I love the new answer boards with the fun art. Adds some nice flavour. 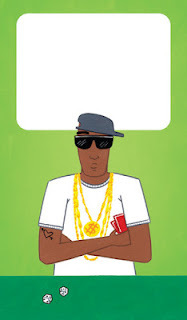 My favourite is the Green (Hip Hop artist) seen below. I must confess, I never really thought Wits & Wagers needed easier rules. However, Im starting to see why this was such a brilliant choice. Even though the game has won lots of awards, and my family already is a big fan. 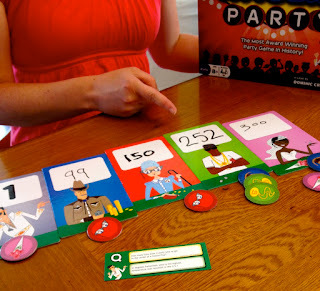 I could see the Wits & Wagers Party edition, being an easier game for non-gamers to purchase because of the simpler rules. Instead of calculating betting odds, the "banker" has an easy job of assigning points. Additionally, the game never seems to have a run-away leader, as the predecessor was guilty of on occasion. So even though I miss the green felt mat, I think there is room for both games in my collection. The original is more suitable for playing with gamers, or when I am hosting games nights. However, I am more prone to lend out my copy or purchase copies of Wits & Wagers Party for family and friends who have little to no experience with games. All in all, I am excited to get more plays of my Wits & Wagers Party. If you are attending GenCon this weekend, or see a copy of this game on the shelf of your local Wal-Mart or Target, I highly recommend you pick it up. The game is affordable, easy to convince others to play, and tons of fun! PS: Just noticed a great contest on BoardGameGeek you might want to check out for a chance to win $100 and a pre-release copy of the game. The deadline for submitting is August 14th. It will sell for $29.99. Wow. Thanks Dominic for answering that question. So awesome you read this post. Awesome game by the way! May i have One to play.